The daughter of well-known treasure-hunter Richard Croft, Lara rejected her parents' fortune and studied archaeology. After graduation, she joined an expedition to the Dragon's Triangle, where she would be tested as never before. 2013's Tomb Raider may have had the same exact name as the first game in the series, but it was a reboot. Lara may have been younger, but she still dressed the same: a blue tank top and tan... well, pants, not shorts, but so what? The laces of her boots and all her pockets are painted on, and there's a necklace visible above the top of her shirt. 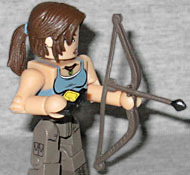 Her hair is a new piece, of course, because while there have been plenty of Minimate ponytails in the past, none of them have been Lara Croft's ponytail. She also gets a flaming stick, a makeshift climbing axe, a bow with two arrows, and a new walkie talkie. She can't carry it all at once, but then, there's no way she'd actually be able to carry all her accessories at once in the game, either. And the bow's handle is too big to be held by a Minimate hand. The Scavenger Scout is one of the multiplayer skins, though dudes hucking molotov cocktails at you definitely exist in the game, too. He's wearing a thich vest with a high collar and a pair of molded goggles hanging around his neck. He's wearing the same boots and left glove as the archer, and carries a flaming bottle. There are two more bottles hanging from the back of his belt. Half his face is burnt, and the hair on that side of his head is missing - if not for the mustache, this would make a great Two-Face. All the Minimates share the same body with different paint decos, and they all move at the same 14 points: neck, waist, shoulders, elbows, wrists, hips, knees and ankles. That's a heckuva lot of motion for something so tiny. 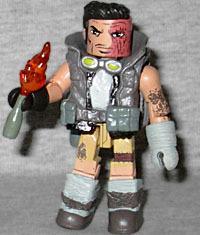 The Tomb Raider Minimates also come with clear disc bases, but the peg is too big to fit in the Scout's boot. 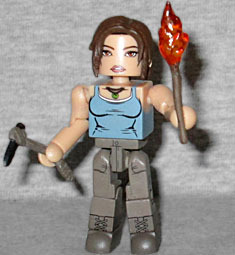 This entry was posted in Art Asylum, MMMR and tagged Minimates, Tomb Raider. Bookmark the permalink.